Who are Whipsmiths and what do you bring to the experiential table? Whipsmiths is an experiential food caterer and ice cream brand. We create new and exciting ways to connect with our clients and customers. We are a collective of technical and design engineers that have a passion for food and in particular, ice cream. We thrive on creativity and supplying new and exciting ways to offer food and flavours using science and technology. Its an experience that can connect with the customer in a way that a billboard or advert simply can’t, creating a memory and something tangible like a taste experience will always be associated with the brand that afforded it. I believe taste is a great sense to instil emotions and has longer lasting reach. It’s also a great way to illuminate the activation in very crowded and marketing heavy environments. What has been the highlight over the last few months? One of the most recent activations gave us the opportunity to connect with international delegates from all over the world at the 2017 TFWE (Tax Free World Expo in Cannes). 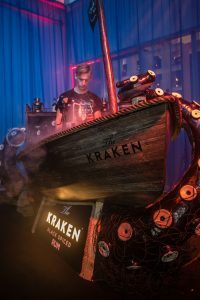 We were asked to create something to represent and promote the “The Kraken Spiced Rum” brand in a very competitive environment. This trade show is where large brands are competing to stand out and showcase their products to a global market. For this brief we needed something not only immersive but also visual, to stand out from everything else on site and to invite the delegates to sample the rum in new and innovative ways. Our vision for the rig was a pirate ship in the midst of being taken under by a giant Kraken. From the shipwreck we should serve a Kraken ice cream coloured and flavoured to the exact flavour profile of Kraken rum itself. 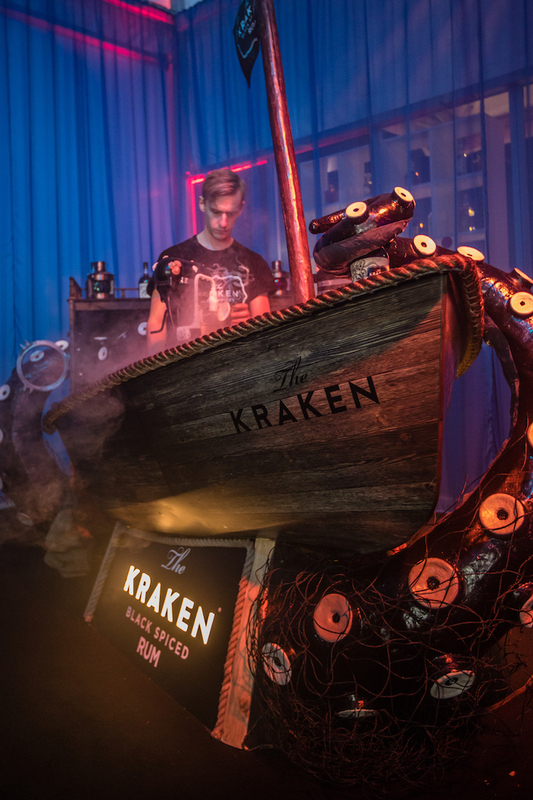 To increase delegate engagement we also created a Kraken “Vape Me Chest” whereby Kraken was vaporised into mist using a sensor creating ultra high frequency waves. This offered delegates a sample of the rum in a different format, which also made the underlying flavours more prominent. The fact the exhibition was set in the South of France also contributed to being one of my personal highlights. What is on the horizon over the next year? Whipsmiths will continue working with brands to create new and exciting campaigns and do what we enjoy most, using science to develop new ways of connecting with clients through flavours and food. Alongside this, we will be opening a number of shopping mall kiosks under the Whipsmiths brand serving our delicious ice cream made in front of the customer each and every time. We don’t really have a dream client as such. We like to start fresh with each brief, I think that’s how we keep our creativity. If I had to choose one I’d say Nutella would have great synergy with us as our Nutella ice cream is to die for and I know how well received it would be at a summer festival. So if anyone can help with that intro -there is some ice cream in it for you. If you were an ice cream flavour, which one would you be? I’d be the flavour of the day. Always delivering a great tasting experience and always changing.